Technology plays a significant role in everyone’s lives these days, and it’s especially valuable when used for planning orthodontic treatment. Dr. Martinez has chosen to invest in the technology that gives him a view of what’s currently happening with your teeth so he can plan the best ways to approach and treat the problem. We look forward to welcoming you to Martinez Orthodontics and showing you how our technology can help you. Until then, please take a few moments to learn more about what we offer and how it can benefit you. Digital radiography or x-rays as they’re commonly known, tell us a lot about the current condition of your teeth. They give Dr. Martinez a view of your general oral health and help him determine what direction your treatment should take. There are many benefits to using digital x-rays, and patient safety is one of the most significant. Digital x-rays dramatically reduce the amount of radiation to which you’re exposed to no more than you receive daily from the environment. Digital x-rays also help you play a part in your treatment because Dr. Martinez can share them with you on your chairside monitor. He can easily point out problem areas so you can better understand why orthodontic treatment is necessary. Convenience is another advantage because we store digital x-rays electronically, so it’s easy to share them with your general dentist, other specialists, or your insurance company as needed. 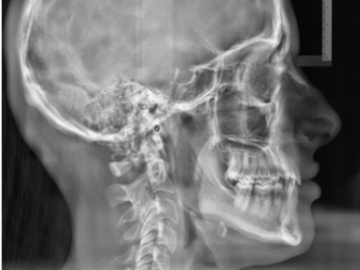 This lateral skull radiogram is the primary diagnostic tool orthodontists use when assessing your facial growth pattern. It helps Dr. Martinez study how your facial bones affect your profile and lips posture. By analyzing the size and position of your jaws and the correlation between your upper and lower teeth, he can identify your malocclusion or “bad bite” and design a treatment plan that best suit your particular problem. In young patients, he can predict the jaw's growth pattern by tracing this cephalometric radiograph and may be able to correct any unfavorable growth if intercepted early in life. In the fully-grown patient, this can help us determine whether to extract some teeth or do a jaw surgery to obtain a harmonious facial profile. When planning orthodontic treatment, it’s essential for Dr. Martinez to understand and visualize all your dental anatomy in one image. 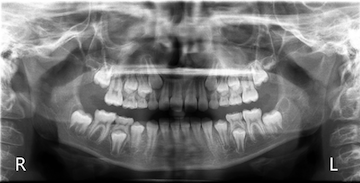 A panoramic x-ray shows the location and position of your teeth, upper and lower jaws, and surrounding structures and tissues. In here, we can see if your teeth and dental bone (periodontium) are in good health. Should we find any area of concern, we will share this panoramic radiogram with your dentist or dental specialist, to make sure your teeth are in their optimal condition prior to starting orthodontic treatment. In children, we use panoramic x-rays to view all the baby and permanent teeth in one image to evaluate positioning and development of their permanent dentition. Early diagnosis and intervention are the keys to solving many orthodontic problems before they become serious. Taking a panoramic image is simple; you stand in place in front of a machine that revolves around your head in a full circle in less than a minute. The process is comfortable and easy, and all you have to do is be sure to stand still!